My mother is a beautiful, proud and decorous Punjabi woman. All her life she has lived an impeccable life. Brought up under the strict rules of my grandfather and the doting love of my grandmother, she grew up to be a woman of morals and high expectations. She watched over her own children like a lioness watches over her cubs. Never missing a beat when something was wrong or bothering us. She sacrificed, but all along kept her individuality, never loosing "herself" along the way. Growing up with my mum was divine. She had a way with words and things that always made us children see the sense in things, even if in the beginning of the discussion we were dead against the idea. This quality was also cherished by my friends, who often spent endless hours discussing their problems and issues with my parents. The house was always full of our friends, coming in and out. There was of course another thing my friends loved about my mum - her food. We always had a fridge full of food. Be it the delicious desserts and cakes my dad brought back from the hotel or the multitude of different dishes my mum had prepared, we never threw anything away. It would always be passed around when our friends were over, during a debate, a soccer game, a problem solving discussion or simply when me and my best friends would return home in the middle of the night after a party and crave for something out of my mum's fridge. She acquired her skills for the Indian cuisine by my grandmother, who was an exceptional cook. 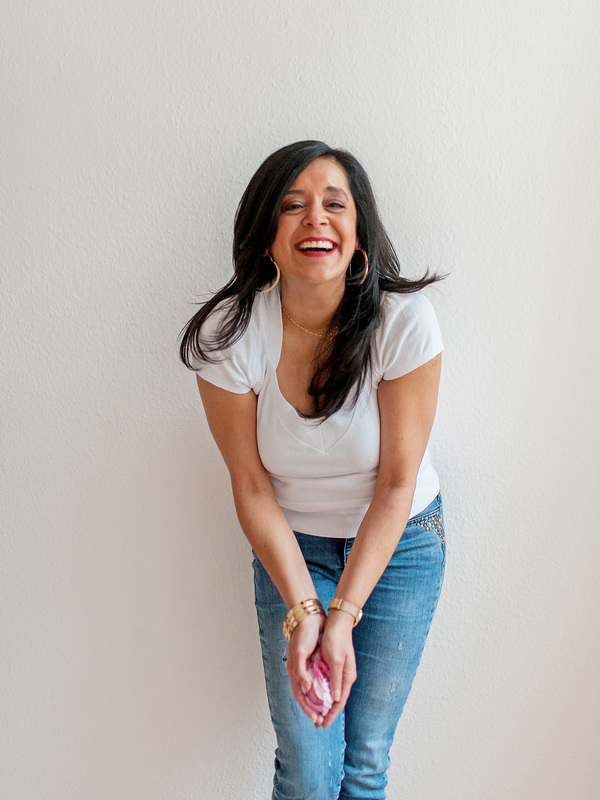 My grandmother groomed my mother, like any good Indian family, at a young age and cooking was one of the most important things an Indian girl learns. However, her talent for the European cuisine was obtained by another great figure in her, and ultimately in my, life. Tante Stephanie was the mother of one of my mother's best friends, Annette. They met during the time my mother traveled the oceans with my father, who at the time was a marine engineer on a ship. It was not long before both found that, although brought up in separate corners of the world, they had a lot in common. A lot but not everything. The one thing that distinguished them was - food. While my mother loved cooking and learned how to make any dish quickly, Annette found food, and everything about food, tasteless. She would eat without appetite and sit at the dinner table only due to pure habit. It was no surprise that Tante Stephanie found joy in my mother's ability to grasp the flavors of a dish by simply tasting them. She was ecstatic at my mother's enthusiasm to learn more about the cuisines she was introduced to. When Annette passed away at an early age it was a loss to both, however they found consolation in each other and of course - food. My memories of Tante Stephanie are simply grand. She always smelled of violets. Even to this day when ever the fragrance of violets wafts through my nose I am taken back to her lovely house on the Loire and the endless evenings on her terrace, eating, drinking and chatting. Tante Stephanie was half French and half Scottish and the food she prepared represented the artisanal cooking of both countries. Traditional, down to earth and down-right good. Cooking was definitely her biggest strengths. She was able to reproduce a dish by simply tasting it. 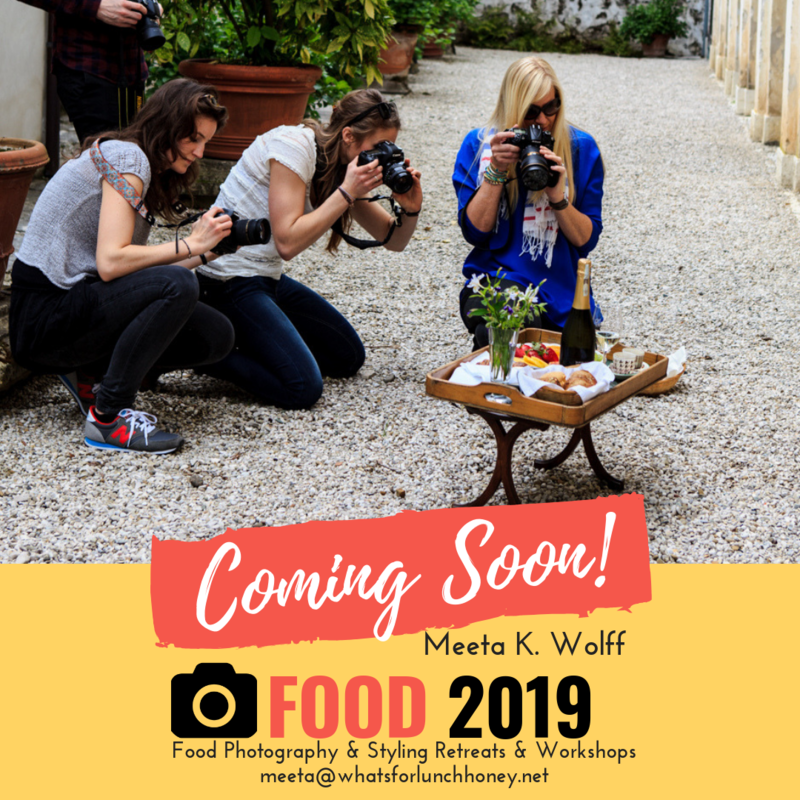 Regardless of how complicated the aromas and flavors would be, Tante Stephanie would know what ingredients were used, in which quantities, how long it was cooked for and how she would perfect it. Her neighbors often called her sorcière, witch and I was always spellbound by the way she moved and casted her spells in her kitchen. My mother savored the time she spent with Tante Stephanie in the kitchen. Each recipe that she inherited from Tante Stephanie was cherished and often recreated in our own kitchen back home. Being the ideal student however, my mother never missed the chance to add her own note to the dish. It was her way of perfecting a perfect dish. 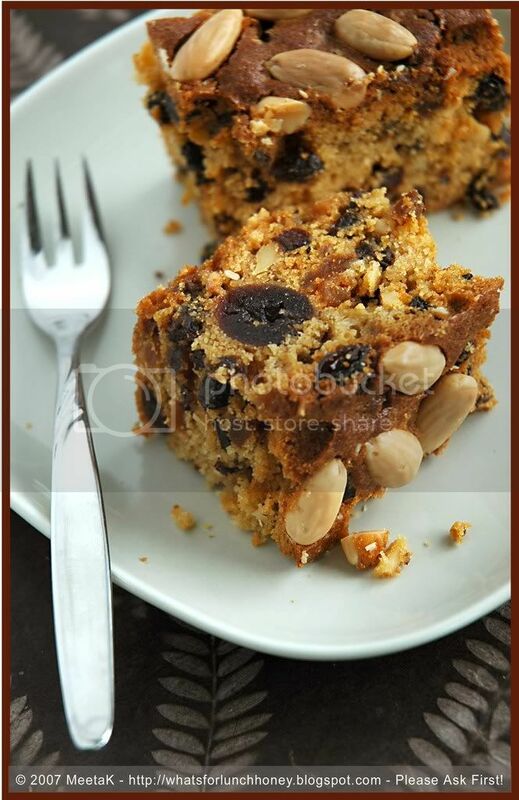 This fruit cake is one of the recipes that was handed over to my mother by Tante Stephanie. The Dundee fruit cake was a kind of family jewel on Tante Stephanie's Scottish side of the family. Her grandmother, her mother and finally she herself prepared it during the Christmas season, each lady adding her own little touch to the cake. Tante Stephanie showed her true affection for my mother by handing the recipe over to her a year before she passed away. My mother in return paid respect to this great gift by preparing this incredible fruit cake each year in December. She too added her touch to the cake. A few years ago I inherited the recipe from my mother. She showed me how to prepare it and we had a great time in the kitchen talking about the great Tante Stephanie. I have been making this cake every year since then, adding my own note to the fruit cake. Although you might be thinking all these modifications that have been made to the cake over the years might not have left much of the original version, I would like to console you. 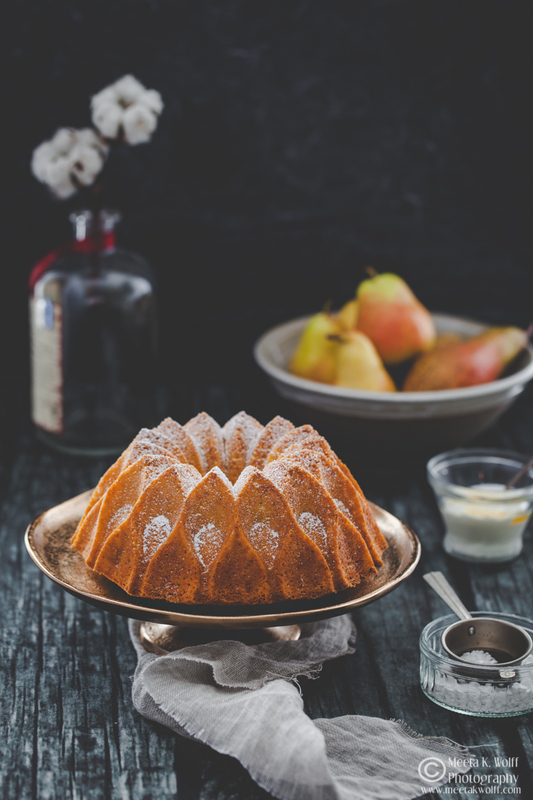 The cake is still very much in it's original form and each sorcière who was handed the recipe simply perfected it in her own way. Printable version of recipe and notes here. Before jumping in and making the fruitcake I wanted to share a few important notes with you. These were all a part of Tante Stephanie's teaching and the notes my mother made. With a little care while preparing the fruitcake and considering these notes, I am sure practically anyone will be able to make a wonderful fruity and delicious fruitcake equally as exquisite as the ones I had the pleasure of enjoying at Tante Stephanie's or later at my mum's. So, in future if you should ever make a fruit cake, either this one or any other one, you will find some very helpful notes here to refer to. The batter for the fruitcake is basically a regular cream cake batter, where butter is creamed together with the sugar and then the eggs are added and beaten in portions to make a smooth mixture. Before you start read the recipe carefully and set out all the required kitchen machines and ingredients. Measure all the ingredients as required by the recipe and set aside. 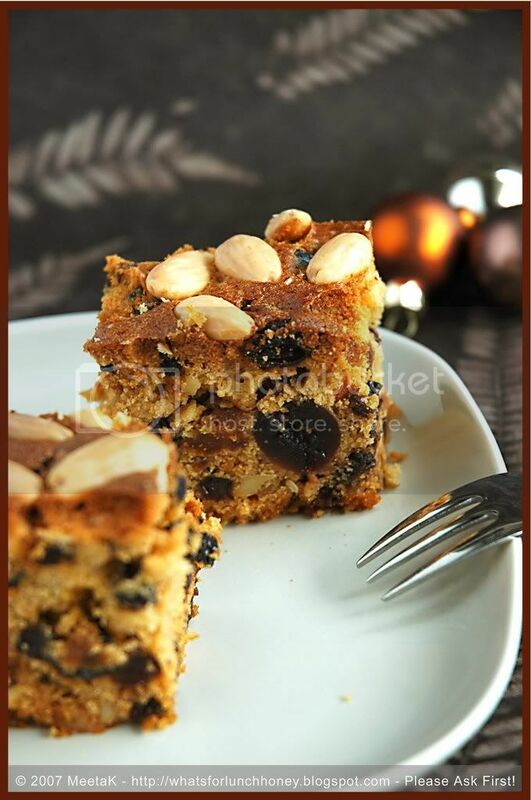 You will need to allot a lot of time to make a really good fruitcake, because the preparations and the baking time takes a little bit longer than most cakes. Before you start with the batter prepare your cake form carefully, by lining it with baking paper and place the oven rack/baking sheet right in the middle of the oven. Then pre-heat the oven at the required temperature. Butter or spray your form, making sure that you butter the sides and base well. Fruitcakes require to be lined with a double layer of baking paper, on the sides as well as on the bottom. Cut out two sheets of baking paper to fit the base and strips to fit the sides of your cake form. Line the base with both sheets of baking paper and overlap the strips for the sides. Press down and straighten out all the creases. Because of the longer baking time, fruitcakes require more protection from the heat. This is basically to avoid the cake from getting too dark around the sides and base. Therefore, pack the outer sides of your form in a few sheets of newspaper. As the oven is set to a low temperature this is totally unhazardous. To protect the form with newspaper, take a few sheets and wrap it around the form tightly, making sure that the newspaper is not sticking in the form. Then simply tie some kitchen thread around the from tightly. As I mentioned above, it is advisable to weigh all the ingredients and prepare your kitchen machines in advance. Sieve your flour and baking powder, chop up your dried fruit and nuts. If using dates or prunes, check if you need to pit them. Take the butter out of the refrigerator in advance so that it is soft once you are ready to use it. Even eggs should be at room temperature and should be taken out in advance. When is the cake done? This was my mum's single one question to Tante Stephanie and many years later, I too asked my mum the same question. Every oven is different, gas, electric, etc. Tante Stephanie simply suggested to use the old toothpick trick. About 20 to 30 minutes before the required baking time of the cake is up, stick a toothpick into the middle of the cake, if it comes out clean then it is ready and can be taken out of the oven. Leave the cake to cool in the cake form overnight. Fruitcakes are actually the most wonderful type of cakes. Their aromas and flavors infuse with each other as time goes on. Tante Stephanie compared the fruitcake to a good bottle of wine - time brings out the best of flavors. So, by leaving the cake for a few days or, as we do, a few weeks - you will be rewarded with an aromatic, fruity and moist cake. 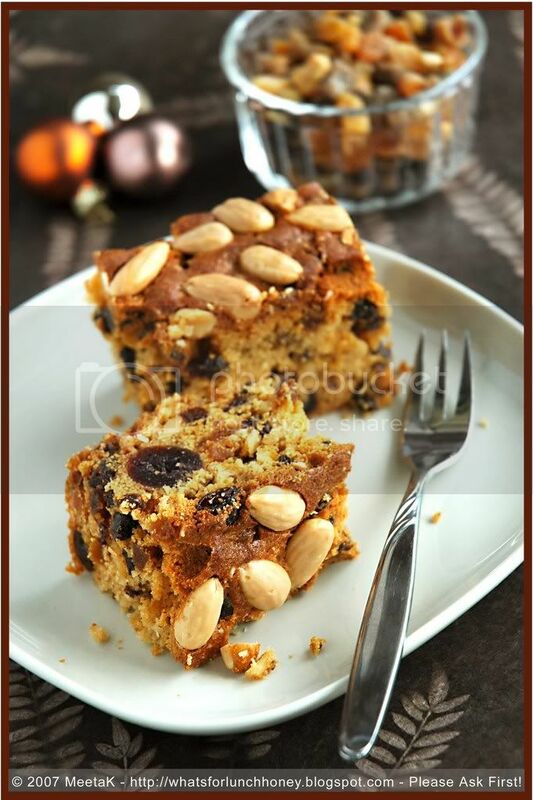 The original Dundee cake is made with currants, raisins and sultanas. 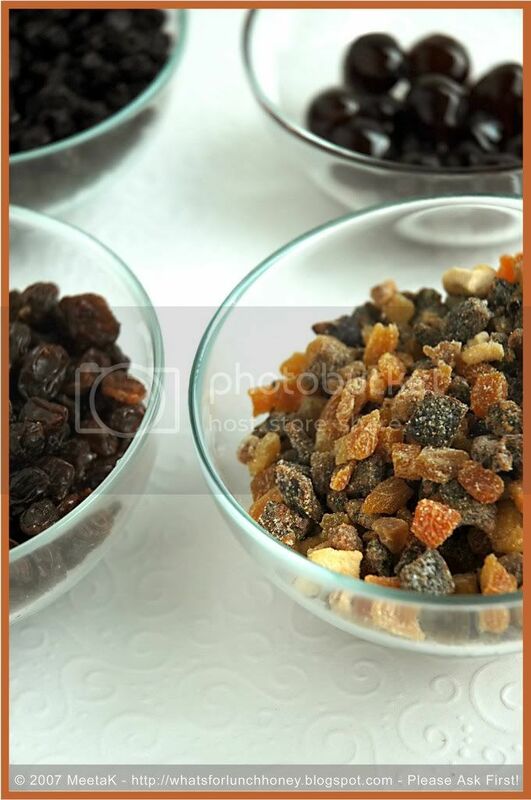 My mother substituted the sultanas with a variety of mixed dried fruit. Tante Stephanie also used cocktail cherries in her version of the cake. My own touch was substituting theses with delicious Amarena cherries. Furthermore, Tante Stephanie used dried orange an lemon peel in her cake, which gave a wonderful fragrance. This time I chose to use dried, slightly sour cherries. Cranberries would also make a great additions to the cake. Pre-heat the oven to 150 degrees C. Prepare a round cake form (20 cm diameter) as explained above. In a mixing bowl cream the butter and sugar using a hand mixer or your kitchen machine, until smooth. Slowly add the eggs in portions - beating each portion until in has been fully incorporated into the batter. Transfer to a larger mixing bowl and add all of the dried fruit, Amarena cherries and the almond slivers and powder. Fold into the batter. Add the sieved flour and baking powder and pour in the rum. Using a metal spoon carefully fold into the butter cream. Pour the batter into the cake form and smooth out the top. Line with the whole almonds. Bake for 2 to 21/2 hours. About half an hour before the the time is up check to see if the cake is done. Place a toothpick into the middle of the cake, if it comes out clean it is ready to be taken out. Allow to cool for at least 4 hours, recommended overnight. Store in an airtight container for a few days, to allow the flavors to infuse. It's always a heavenly experience when I make and then eat the cake. I am always taken back to Tante Stephanie's house on the Loire or my mums's kitchen in Doha. Filled with good memories and cheerful spirit this cake is pure pleasure. I normally make the cake towards the end of November. It is then stored for a week in an air tight container and then we enjoy the full flavor of this luxurious cake throughout December. The cake will be on the dry side when you cut it a day after it has been baked, but if it is kept for a few days it will begin to get more moist as the fruits combine their juices into the cake. This is my own entry to this months Monthly Mingle - Traditional Feasts. lovely post and fabulous looking cake..... you've tempted me so much with the pics that i took a printout of the recipe already!! what a magical post, Meeta! 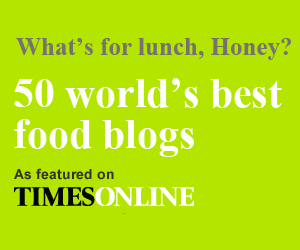 No wonder you've inherited all the creativity and fondness for food from your mother. I read the post twice and already in love with your mom:) And it's really generous of you to have shared this family recipe with us. I do hope to recreate the magic at our home sometime. Well for a question on the recipe... can the newspapers be replaced by alu foil to wrap the form? I am trying it, with ground almonds and everyting it should taste extra tasty. Loved the photos,very delicate yet soph1sticated Xmas tones! 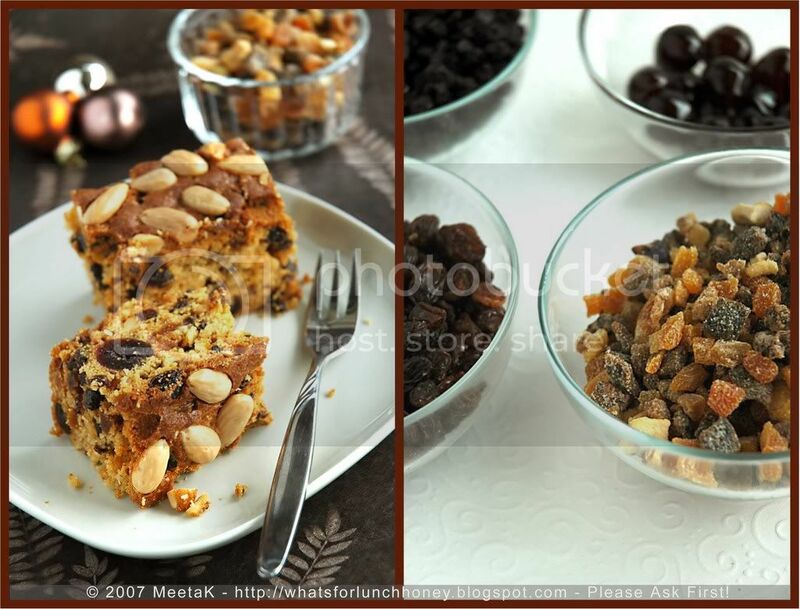 i adore fruit cakes, meeta, and yours is one of the most gorgeous i have seen. Not sure what you mean by the newspaper layers to the form. Cna you please explain that in detail. I am not sure I understand the newspaper layers to the form. Can you please explain that in detail? Thanks. Excelent for the festive period. Loved reading about your mom . What a beautiful post, Meeta! I really enjoyed reading it. The photos are lovely! That is a thing of beauty, Meeta. Really is. Especially with the pale, smooth almonds on top. Dundee cake. Yes. However, being a Yorkshireman, I would argue that it is infact a Yorkshire fruit Cake, although we do like to claim everything as our invention, lol. Shyam, glad you liked it. Arundati, Great hope you like the new printing feature and also hope you let me know how yours turned out. Latha, oh I am sure my mum will adore your comment LOL! Yup, I did ask for permission though and my mum simply said "if a bit of flour, nuts and fruit bring joy to your blogger friends then do it!" Archana, ahhh madame cakes LOL! let me know what you thought of it. Thanks for the comment! Bee *blush* in that case i hope when you make it, it will be the best you have ever eaten! Bala, it's easy - you have to wrap the outer sides of the cake form in newspaper. As if you were wrapping a gift but leaving the inside of the cake form free. Then to keep it all in place tie it with some kitchen thread. Hope I was able to explain myself in more detail. Dagmar, glad you liked it. Hope you get a chance to make it too. Graeme, oh you English men are all the same - hehehe! Yorkshire here or there glad you liked it! Meeta, having the opportunity to read about your family (especially about your wonderful mother) was such a treat - the details that you shared make me feel as if I KNOW your family!! So nice to read. That was such a sweet post...and the cake, simply out of this world. Beautiful fruitcake, and such lovely memories of your family. My husband is always looking for a perfect fruitcake recipe; I'm sending him your post. I love fruit cake and this one looks like a keeper. A lovely story about your family. What a wonderful story, Meeta. And the fruitcake is gorgeous! What a great post. It sounds fantastic! I've never had fruit cake before, but this looks really tasty. Meeta, this is such a wonderful post. You literally made me want to meet Tante Stephanie, your mom and Dad...Wish you would post their pictures ..it will be so lovely to associate with you have written. A great tribute to great people..thanks for sharing such a delicious looking cake. Am sure it won't stay more than 10 mins after baking...:D.. I made my first fruit cake last Christmas, specially for my dear friend who was 8 months pregnant and wasn't able to muster up her usual enthusiasm for Christmas. The recipe I used was from another friend in the UK, a warm lady whom I have never met in person but have become so close to online, its like we have known each other forever. Your story about Tante Stephanie and your mother was a beautiful one and so is the cake you baked - simply gorgeous! Fantastic read Meeta, as always. I am one of the few to admit that I like fruit cakes, from all over the world, from all different traditions and recipes. This one looks scrumptious. Sorry I could not make it to the Mingle this time, things have been kinda of crazy. I will make sure I share my holiday tradition of Suzanne's chocolate truffles very soon though! It really looks delicious. I always wondered what a fruit cake really was, since I came to the US and everyone kept saying terrible things about it. I think I'd love to try this! What a wonderful piece at a time when we are thinking even more about our families. And a beautiful treasured recipe you have shared with us here. What a beautiful post, Meeta! What a BEAUTIFUL story! It sounds to me like Allende's characters... only a bit ;-). ... And the pictures are so vivid! How funny Meeta - I wouldn't have guessed at Dundee cake being your family feast recipe! Remya, tempting you to make something you love is great! So go ahead and make it - you'll love it! Sandeepa, LOL! I do not think my parents would like having their faces splattered over my blog. maybe I can send you a picture of them instead - but if you miss a heartbeat I'd be to blame for it! LOL! Lydia, I do think your husband would like it. Perfect well I think it is - maybe he can add his touch to it to perfect it for his own taste. Pea, baby if you give this a try let me know. I would love to hear your thoughts on it! VG, thanks! My family is a pretty wild bunch but it makes us who we are, loving, fun, and just a bit crazy! A question how would you veganize this one? CC, Kalyn ans Siri, glad you liked it and thanks! Mike, so what are you waiting for. Make it!! Srivalli, thanks for the compliments. You will have to really try to leave it for a few days. Because that is when the best of the cake comes out! Miri, yours is a touching one too. Thanks for sharing it! Helene, I know how things have been for you so do not worry. There will be plenty of mingles. Look forward to your post! Marta, forget what they say - it is the best thing at this time of year. You can spice it up, add more nuts or fruits whatever takes your fancy! Anita, Nupur Patricia, thanks for your thoughts and comments. Nuria, wow! I read Daughter of Fortune a while back and I love her style. So it is a real compliment that you should compare, me, my post and characters to her - even if it's only a bit ;-) Thanks! 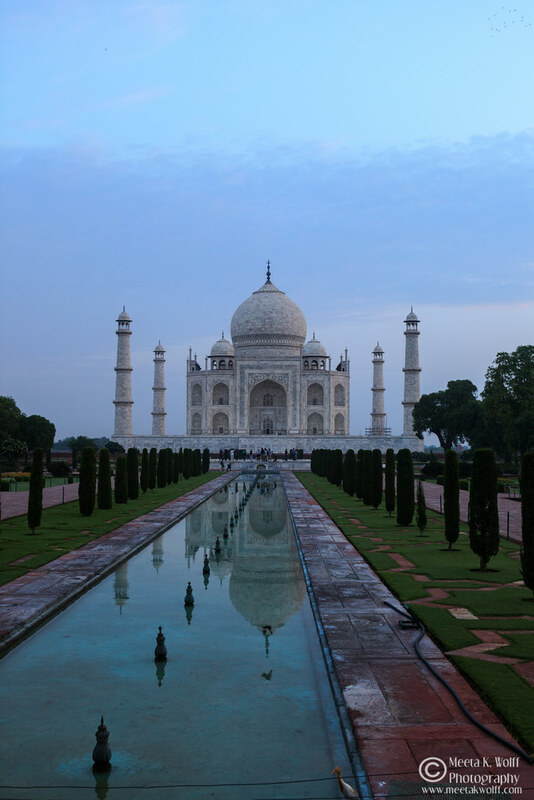 Pooja, glad I could make you stay and read the whole post! Sophie, hehehe! Told you we were international. The idea of having it with cheese is an interesting one. Does it really taste good? I answered your comment on my blog (in my comment box), about the hazelnut-milk. Just letting you know, haha. I saw your other comment on my Thanksgiving post - I am thrilled to hear that you would like to add more vegan foods to your diet!! every little bit helps :0) if you need anymore information or tips, I would be happy to email with you!! - replace the eggs with soy-yogurt in cakes, preferably a vanilla or plain flavor (I used this egg-replacer method in that pineapple cake that I just featured on my blog). it makes for a moist, dense cake and I think it might work well with YOUR cake as well. usually, it's 1/4 cup of soy-yogurt per egg, but I think it would work to keep it between 1/2-3/4 cups here. of course the best way to do it would be to see how moist the batter is while mixing. I use the WholeSoy soy-yogurt brand, but another good brand to use is called Silk. see?? it's not that difficult to "veganize" a recipe :0) Do let me know how it turns out, Meeta!! Wonderful looking cake, I must say ! I am definitely going to try this one...just had a question for you, Meeta.Most of the cake recipes I have come across requires you to bake at about 350 F for 45 odd mins...any particular reason for baking at 150 F for 2 hours ? Meeta, Words cannot express how delighted I am to see this recipe. I totally adore fruit cakes. Picture perfect. VG!!! AHHH thanks for all those tips for the fruitcake. While I do not think I will be making another fruitcake this year, I certainly will be using it in other recipes. You are gold!! 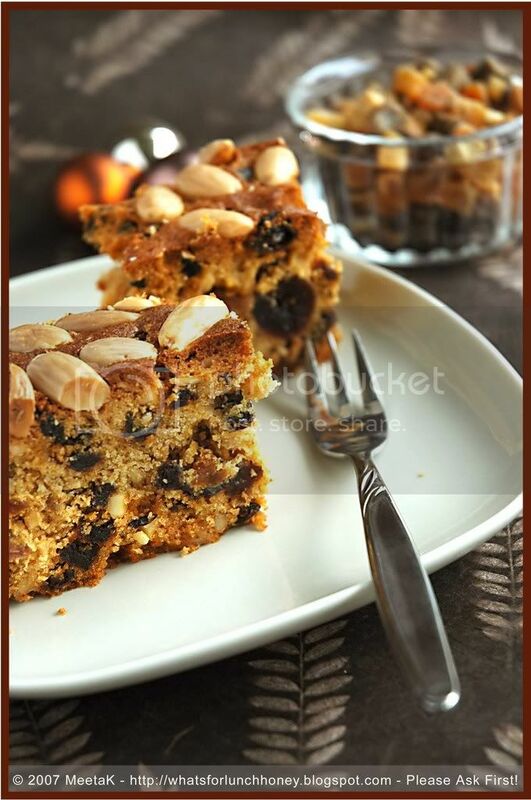 Ashwini, this cake needs to be cooked at a low temperature so that the fruits and nuts do not burn and it gives the flavors a chance to infuse better when you bake for a longer period at a lower temperature. If you increase the heat even if you decrease the baking time you will most definitely see a difference in the texture, color and finally taste. Sug, I am glad you liked it - now I am hoping to hear what you thought of it. I have one question to ask on the ingredients:) Would you know if dried orange/lemon peel is available in reformhaus or bio-shops? If yes, what is it 'auf Deutsch';) Thanks, Meeta! 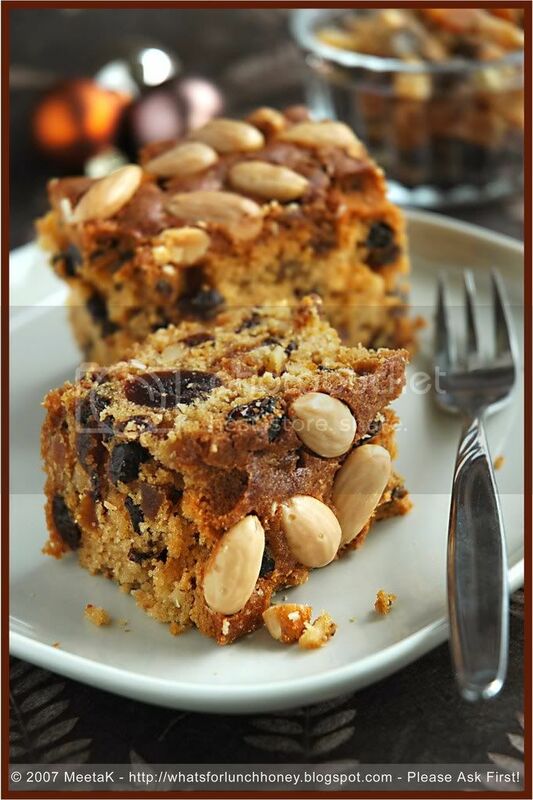 Dundee Cake, how I would love to try yours Meeta. How lucky you are to have all this history for this cake! I just wish I knew where my mom got her fruit cake recipe. lovely post meeta.. well written with the right amount of love and tribute! the fruit looks awesome.it is simply beautiful. Just wanted to let you know that I tried this recipe last night. This morning I was in heaven when I took a bite of this gorgeous looking cake. Its simply amazing, and so easy to make. I am going to make it again for my Christmas party. I know this cake will be hit! Latha, you can use "orangeat or zitronat" available in almost all supermarkets in Germany. Tanna, thanks. It is often the memories that make such cakes sweeter. Shahhen - i am so glad to see you! Thanks for your comment. Priscilla, WOW! Glad you liked it. I am always touched when people come back to tell me about how a recipe turned out. WIsh you agreat X-Mas and thanks! Oh yipeeee Latha! I am so glad that it worked and thanks for your feedback, I love getting information like this. I hope everyone will enjoy the cake too and maybe it might become your own traditional keepsake! I hope this will be my last question on the cake (blushing)... I was asked to slice the cake for practical purposes (hee hee) so did that (no i'm not complaining... one who sliceth the cake gets to eateth all the crumbs!). I got quite a bit of crumbs... is it normal or is there a special way to slice a fruit cake? thanks for your patient replies despite the busy season, Meeta! Hi Meeta, first time commenting on your blog. This was such a wonderful recipe. I made it over the weekend - I couldn't add the rum for various reasons, and just for kicks I mixed in 2 tsps of instant coffee (Bru). The result was a super fragrant, dark fruitcake that hada slight hint of bitterness. Thanks a MILLION for this wonderful recipe! I made this cake yesterday and it turned out GREAT !! I had no patience to let it cool over night, so I ended up with quite a few crumbs, however its tastes amazing ! Can't thank you enough.. I also made your orange cake few days ago & that turned out great as well..Your blog & all ur wonderful recipes succeed in making people happy in their own special way.. You are doing some GREAT work out there Meeta !!! You are the best ! Came across this post accidentally and loved it! Tried it last week and it turned out so well! Absolutely loved it!